One of my foodie friends, Laviza, recently posted a recipe on her blog (www.lazizabites.com) for Za’atar Grilled Asparagus with Onions and Garlic. Laziza means delicious in Arabic, not to be confused with her name Laviza, which in my dictionary also means delicious… trust me, I’ve eaten her cooking. Laviza’s blog focuses on global cuisine and she always has something unusual to share from her kitchen. This asparagus from her blog looked great and I wanted to give it a try. I’d heard about za’atar, a Middle Eastern spice mixture, but had never tasted it and certainly didn’t have any on hand. After a little research and a quick consult with Laviza I made my own. I’ve been slowly expanding my spice collection. The breadth of spices available is mind-blowing. My collection already included ground sumac, a key ingredient in za’atar. Sumac has a unique sour, almost vinegary taste. It’s a must for this recipe. I would recommend doubling this batch of Za’atar, so you can keep it on hand. In looking around online, there are recommendations and recipes for using it on everything from grilled meats to popcorn. 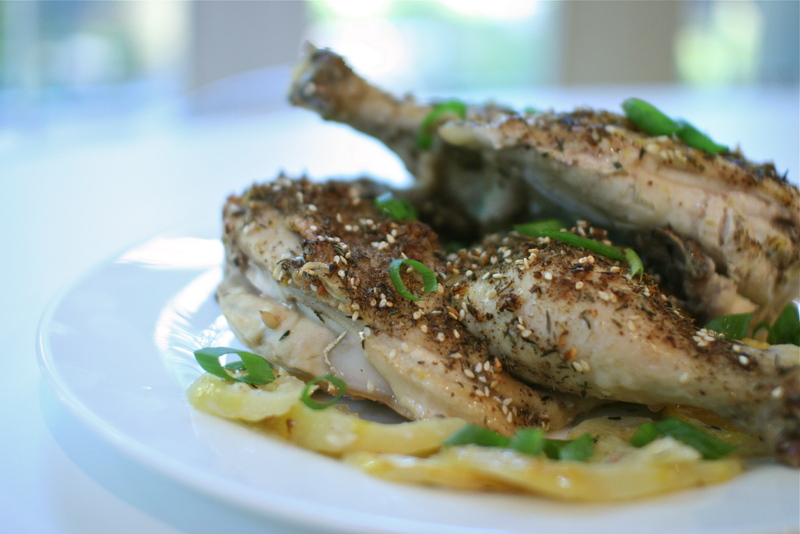 I decided to use the za’atar (or zahatar or zaatar) to make roast chicken. 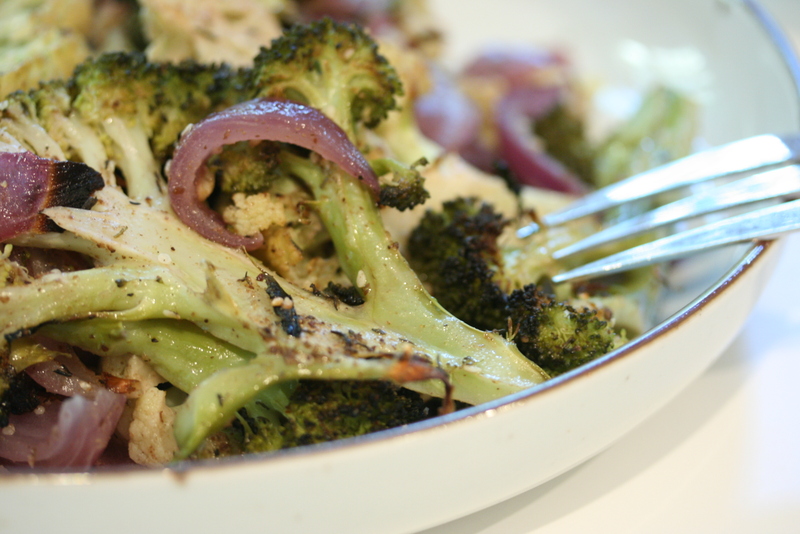 I also roasted broccoli, cauliflower and onions with the za’atar, this might be a way to get the kids to eat their vegetables. It made for a delicious and healthy dinner. No matter how you spell it, za’atar is now a permanent part of my spice collection. Place all the ingredients in a container and shake it up. You can store any leftover za’atar in an air-tight container at room temperature with your other spices. I should note that there are many variations of za’atar. Some use fresh thyme, some use fresh oregano, some use dried herbs as I did here. Some recipes call for toasted sesame seeds and some not toasted. What they all seem to have in common is ground sumac. Start your search today. I found it at The Larder in Doylestown, PA. You can also find packaged za’atar in specialty food stores. Cut the vegetables in wedges… almost like little trees. I like to keep a nice amount of the stems on, they’re just as delicious as the tops. 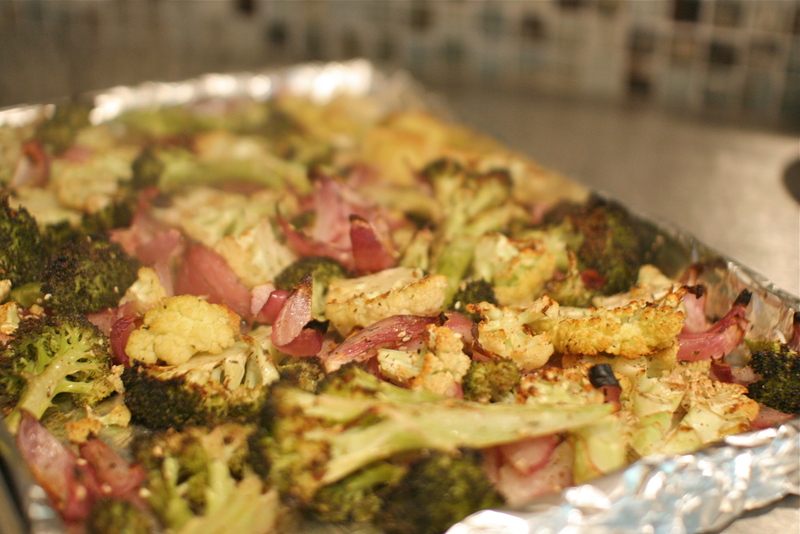 Lay the broccoli, cauliflower and onions on a sheet pan. Drizzle with the olive oil and sprinkle with the za’atar . Using your hands, toss the whole thing together to make sure it is evenly coated with the oil and spices. Roast in the preheated oven for about 20min or until the veggies are browned on the edges and tender. Remove the backbone from the chicken and cut it in half… or you can have your butcher do it for you. Chop the garlic and lemon zest together. Carefully run your fingers under the skin of the chicken and put the lemon zest and garlic mixture under the skin. 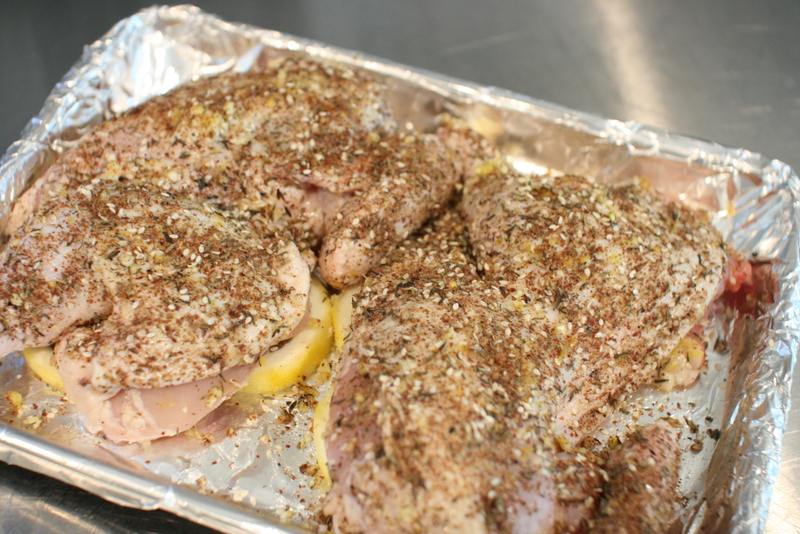 Rub the outside of the chicken with a little olive oil and sprinkle the za’atar all over the chicken, rubbing a little under the skin. 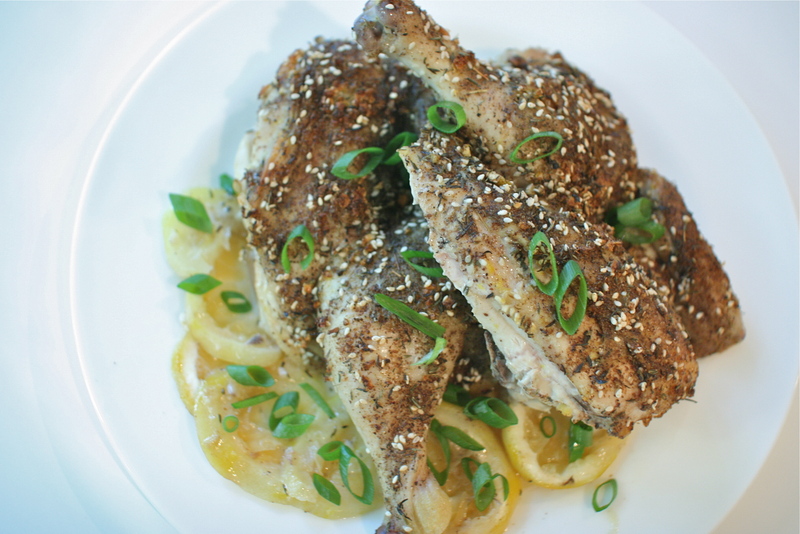 Lay the lemon slices on the bottom of a sheet pan and place the seasoned chicken on top of the lemons. Roast the chicken in the preheated oven for about 40 minutes or until it reaches 165 degrees. Enjoy! Here are a few other great looking recipes that use za’atar. This blog has become a labor of love. Often when my culinary creativity is feeling a bit squelched, I remind myself that I created 4plates as a personal outlet. Sunday I woke up and it was Father’s Day. I woke up to an empty house. My husband left early that morning on a business trip and my daughter was with her dad. I lingered in bed with my beloved Sophie Bubbles, listening to all 22 pounds of her snore like a full-sized man and thought, what cooking inspiration can I share this week? I know for many of you out there with kids, a quiet day at home sounds like a dream. For me, I missed my dad who passed away long ago and I missed my family. 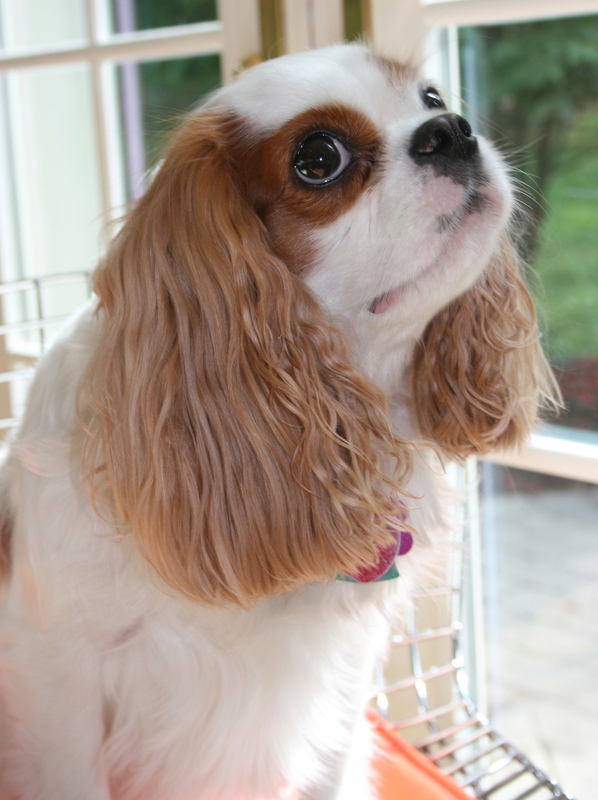 Am I allowed to say I’m grateful for my Cavalier, or would I sound too much like one of those weird cat ladies? Sophie is my constant companion, always by my side. Sometimes under my feet, a little too close, offering too many licks, but just look at that face – her kisses are hard to refuse. I was recently told by someone that they love my blog, but found it odd that I didn’t post a photo of myself or my name anywhere on the site. Good point! I never even noticed, but since I am the constant photog around here, I’ve now realized that photos of me are pretty scarce. 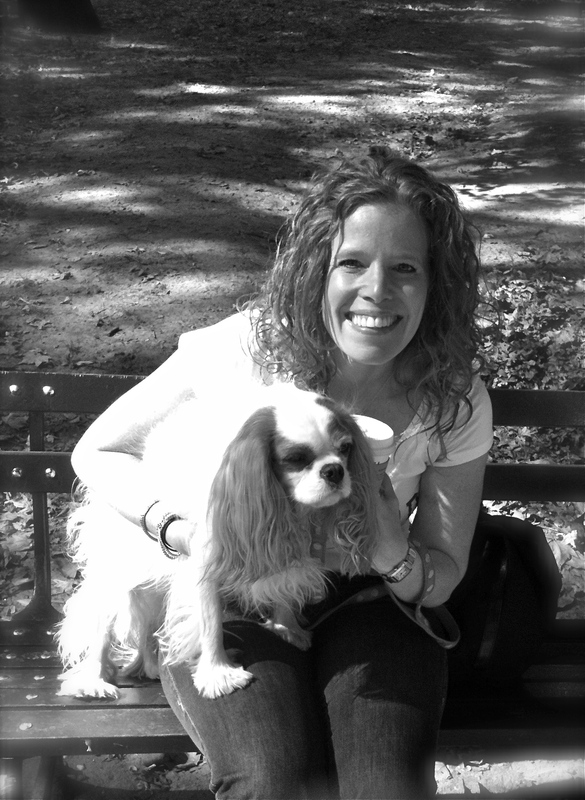 Here’s a picture of me, Nancy Jacobson with Sophie Bubbles in Central Park, NYC. Given the context of this post, I thought it was àpropos that I post a picture of me with my furry friend. I will work on another photo of myself for the blog someday soon. It’s summertime! Warm weather and sunshine. I think a refreshing recipe using watermelon is in order. 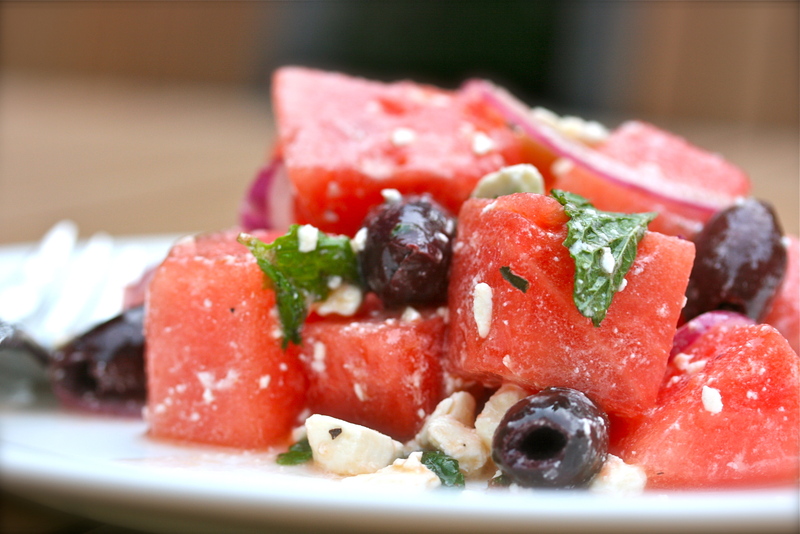 If you’re in need of a fast salad to throw together for a picnic or BBQ, this is a must. You can pull this together in mere minutes and everyone will love you for it. 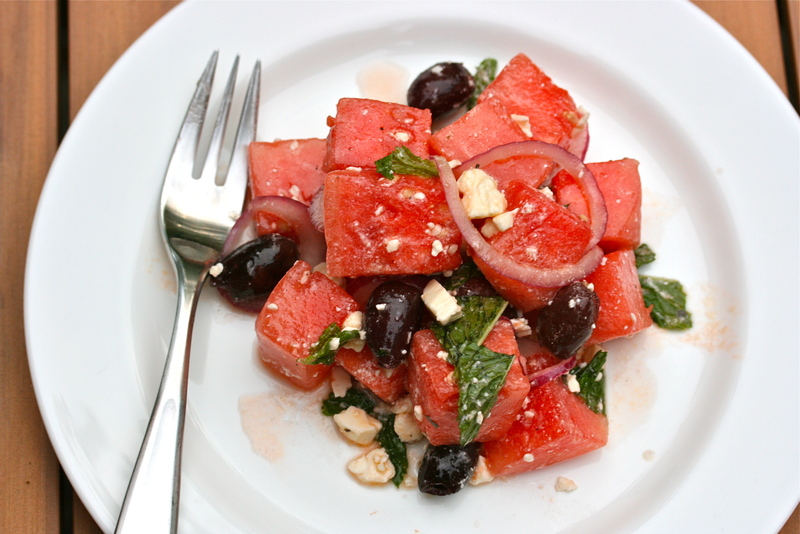 Place the cubed watermelon, olives, feta and sliced onions in a large bowl. Whisk together the lemon juice, olive oil and honey. Pour over the watermelon, season with salt and pepper to taste. Sprinkle in the torn mint leaves, give a final toss and serve immediately. * I purchased one of those cute mini-watermelons for this salad. I only used half. I suspect that a 1/4 of a regular watermelon would yield the same amount. You can’t really mess up this salad.